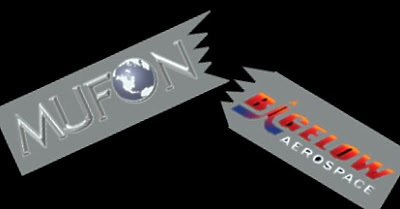 MUFON (Mutual UFO Network), was the largest international UFO research organization in the world. The STAR Team was a Rapid Response UFO Investigation Unit that was funded by a special program within MUFON known as the SIP Project. During the period from February 2009 until January 2010, I served as the STAR Team Manager and SIP Project Coordinator. I was also State Director of North Carolina MUFON and Chief Investigator for MUFON of Virginia. This investigative program came to an unexpected end in January of 2010. Since then, I have received countless phone calls and email requests asking me to explain or confirm details of this project and the controversy that surrounds its premature ending. So many rumors are floating around the internet and many questions have come to the surface. I currently do not have any official association with the MUFON organization, I am no longer a member or an employee of MUFON. It is not my intention to finger-point or accuse anyone. I will admit that I do not completely understand the motivations of some of the individuals that played roles in MUFON leadership. I do not know what they were thinking, but I do know a lot about what happened! The following pages reflect the facts and occurrences as I remember them from my perspective and will help one understand what went wrong. It is not my propose herein to discuss the actual SIP Project cases or the impact the SIP Project Investigators and the Dispatch Operators had on the MUFON organization. Most of you have looked at the cases, read the reports, seen the articles in the MUFON Journal and have decided for yourself about the worth of the SIP Project. In General I believe that the management at BAASS was very satisfied (at least from an operational standpoint) with the quality of the reporting (data sent to them) and investigative work performed by our SIP Project Investigators. BAASS investigators were given full access (password and user ID) to the CMS data base, in all cases where the witness answered "YES" to the "third party release question". BAASS personnel and investigators could see all case information in CMS including witness contact information. Note: BAASS Investigators were independently investigating UAP events reported to them by MUFON witnesses. BAASS is a private research organization and they do not share their proprietary information and research with MUFON. MUFON also provided data to BAASS about significant events that were reported in CMS. These events were identified by the Dispatch operators and reported via email by me to BAASS as they developed (and summarized in a weekly report which was sent to BAASS and selected Board members). A Significant Reportable Event would be (for example) multiple witnesses reporting an object within close proximity, or a case report submitted by a trained observer like a Pilot, Police officer or Air Traffic Controller. Any landing case or one that involves possible physical evidence would be passed along as well. A conference call was facilitated Between MUFON and BAASS every Friday to discuss the weekly report, review cases and discuss issues between the two organizations. I facilitated this conference call every week. Sometimes James Carrion, Jan Harzan, Chuck Reever and Chuck Modlin also participated in these calls. Funding for the project was initiated at the beginning of March 2009 when the first check was sent from BAASS to MUFON in the amount of $56,000 for the month of MARCH. 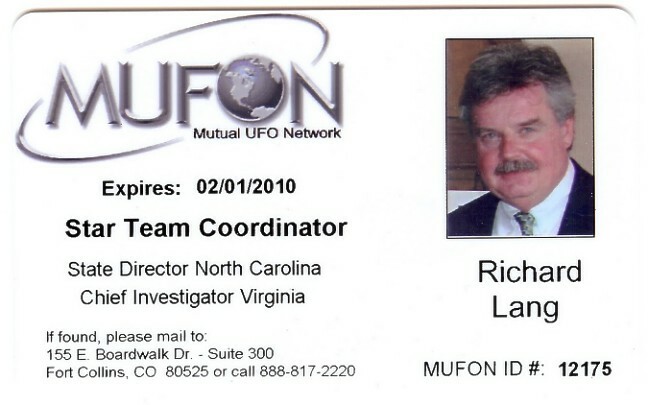 (I cannot state the exact date but I remember the first check came to MUFON HQ sometime during the last week in Feb.2009) The SIP Project was actually not operational until the first week in April 2009. However I am sure some of that funding was used for the ramp up costs associated with the project. The SIP Project ran for 10 months. During that time we deployed on (investigated) about 65 SIP cases. We also sent data in the form of Significant Reportable Events (about 25 per month) to BAASS as well. At last count we had about 80 STAR Team contract Investigators and 8 Dispatchers. From the onset there has always been this misconception about the SIP Project, the idea that there was some kind of secret side to the program. I have repeatedly defended the SIP Project at least from the operational standpoint (which I managed) in terms of complete disclosure of all investigative data developed for the project, during the time I managed the project. Each Investigator and Dispatch operator was asked to sign a confidentially agreement that required strict confidentiality in force during the deployment and no media communication. 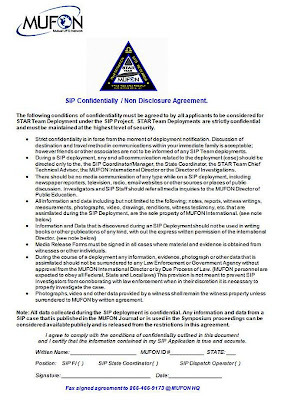 The agreement also states that information and data from a SIP case that is published in the MUFON Journal can be considered available publicly and is released from the restrictions in the agreement. Note: All STAR Team deployment (cases investigated) were put in CMS and Published In the Journal after completion. According to the confidentially agreement they are public information. As indicated in previous updates, I managed the SIP project as far as operations, Dispatch, Deployments and Investigations. I did not have responsibility for the financial management and did not have direct access to the bank accounts or accounting. The Contract Agreement provided for the amount of $56,000 to be paid to MUFON each month. It was initiated at the end of February 2009 and ran through the end of February 2010. 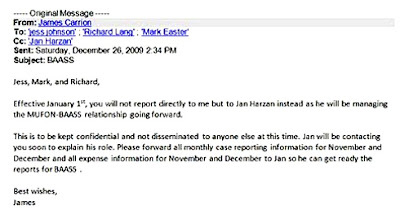 It was a one year agreement with performance reviews every 4 months, the first being in June 2009 and then again in Oct 2009. Provisions were made for merit-based increases in funding as well as for BAASS or MUFON to cancel the agreement. In total, MUFON received only about $324,000 from BAASS SIP Project, which was a little less than half of the original contract deal that could have paid a total of $672,000 in the first year to MUFON. MUFON Board ultimately left over half of the allocated SIP Project funding on the table, leaving MUFON almost broke, having to close the office in Fort Collins and lay off the last of the remaining two employees. February 2009 - BAASS Contract Agreement was finalized and approved by MUFON Board. This PowerPoint presentation was emailed to State Directors. March 2009 - First Funding check from BAASS received by MUFON sometime before March 1, 2009 and a campaign for hiring for Dispatch Operators and Field Investigators was initiated. Live Presentation for a rollout of SIP Project to State Directors was set up via scheduled conference calls, looking for State Directors suggestions and input, fielding questions and getting their buy-into program. Final planning for SIP Project completed based on State Directors input. Application and enrollment period – received applications at MUFON HQ. SIP Project Management Team meeting in Colorado (4 days) to review applications and finalize hiring of Dispatchers and STAR Team Field Investigators. Applications processed and paperwork was completed for employment and tax withholding for 12 Dispatchers and 54 Investigators. Live training meetings were conducted for the Dispatch Team, via a series of conference calls. SOP for Dispatch operation was finalized. April 2009 - First Successful month of SIP project and Dispatch Operation started to run continuous shifts. June, 2009 - Performance Review - Concerns were raised by BAASS about funding and the excess funds that were not spent on the project by MUFON. There was clearly some gray areas in the wording of the contract agreement, in that there was not specific language as to how MUFON could or should use unspent funds. As part of the performance review process, in June, BAASS reduced the amount of money they were sending to $25,000 a month. Both parties had opposing thoughts on the issue. MUFON taking a position that they could keep the excess money, without accounting to BAASS for how they used it. MUFON was spending about $25,000 per month on the project and had accumulated about $120,000 in savings, which was not spend on the SIP project. Note: incentive bonus was partly paid for one month and then discontinued to save money. A Public Relations person was ultimately hired late in the program. National police advertising and Google ads were never initiated. These problems were not resolved and it was obvious that animosity toward BAASS was building with-in MUFON Board Leadership. July 2009 - Symposium - I personally made a presentation at the State Directors meeting explaining the SIP Project, which lasted over 2 hours and was well received. After I spoke a financial report was made to the State Directors. At the time I was very busy (with my presentation and the training meetings) but I remember being very surprised when the financial report indicated funds in MUFON at $54,000. At that time there was an additional $120,000 in a separate checking account for the SIP project, which was not disclosed to the membership. I have often wondered how this would affect the Non-profit status of the organization. September 2009 - By September the animosity toward BAASS was continuing to build within MUFON Board Leadership. At the same time the SIP project was running in high gear and BAASS was very pleased with the work the STAR team was doing providing the Significant Reportable Events and Case Reports. There was a lot of good publicity about the SIP project. The quality of the SIP investigative work was considered very high. The dispatch operation was well organized and producing very useful information. The weekly Conference calls with the BAASS management team were getting more intense, with Carrion, Harzan and Reever very upset with BAASS, while Modlin and I remained supportive of the project. I was in a sticky spot trying to keep the SIP project going forward, while tension continued to build about the funding issues. The BAASS guys were always very professional with me. I was embarrassed at times with the way MUFON Leadership treated them. BAASS was still very cognizant of the $120,000 which they believed to be in savings and it was clear they were going to take a stand with MUFON to get more money spend on the project. Behind the scenes, there was a lot of tough talk about BAASS trying to control MUFON and the MUFON Board wasn't going to put up with it! I never understood this because no one at BAASS ever tried to interfere with the operation of the SIP Project or tell me what to do. Note: apparently after the symposium, MUFON moved about $30,000 of the SIP Project money to the MUFON account, to help pay for the symposium, which was not disclosed to BAASS (in the monthly reports) at the time when it was done. MUFON later maintained that it was the equivalent of Carrion's salary that he donated to the symposium. It became an audit issue became it was not reported to BAASS until much later in the year. The BAASS guys had articulated to me a number of times that they wanted to work this out with MUFON. At that time my relationship with the BAASS management was good and a high level of trust had developed. The project was going better that ever expected. BAASS was very happy with the Dispatch Operation (data) and the quality of the work the SIP investigators were providing. It did not appear that much communication was taking place, in that that Carrion and Harzan were at an impasse with BAASS. October, 2009 Performance Review brought about another problem. BAASS sent a letter to MUFON indicating they were going to reduce the funding to $15,000 (which would force MUFON to spend some of the money in Savings). It was explained to me, that the $15,000 was intended to at least cover the salaries for next 4 months of the SIP Staff (SIP Manager , Operations Director, Public Relations Director and Dispatch operators) until the issues could be worked out. No additional funding was ever received form BAASS after that. November and December 2009 - During November and December the SIP the project continued without any outside funding, rapidly dwindling the remaining financial resources within MUFON (cost then about $28,000 per month). During the last couple months I was never able to discuss this with Carrion and do not know what his thinking was, but it was obvious that he was not happy with BAASS and was losing interest in the SIP project. During the Christmas holiday I initiated a conference call with the Dispatchers and let them know we were running out of money. Moral was very low on the team. They had worked so hard to build the STAR Team to a level that had not been expected. January 2010 - as MUFON was rapidly running out of money, the negotiation to get BAASS to continue funding was suddenly intensified on the part of the MUFON Leadership..
Harzan made several requests to BAASS asking them to at least send enough money to cover salaries. You have to wonder what they were thinking when back in October MUFON was offered $15,000 a month (from BAASS) and they refused it. More critical there was a growing concern developing at BAASS about the monthly financial reports that had been provided to them for the SIP project. Per the Contract agreement, each month a financial Report accounting for what was spent on the SIP project was required to be sent to BAASS. The report included salaries, operating expenses, travel, lodging and pay to investigators for each respective month. I discovered by accident one night (late) when I got a call from BAASS that there was a problem. The lady (BAASS office) wanted the operations manager's phone number. I asked if I could help with anything and she told me that they were having trouble opening the Quick-Books that MUFON sent over, which seemed very strange to me. I spoke with the our SIP Operations Manager the next day. She confided to me that she was instructed (by Harzan) to turn over the Quick-Books for the SIP project to BAASS (for audit by their accountants). I did not realize until a couple of weeks later how devastating this actually was going to be. MUFON was in a desperate situation financially and was now almost begging BAASS to help (by sending some funding). What I didn't know until later, BAASS had been looking very carefully at the monthly reports they had been getting for the SIP Project. Before the holidays (November) BAASS had apparently made several requests for more detailed financial information about how MUFON spent the funding, which were not acknowledged. BAASS made it clear that they would not send any more money until MUFON gave them the financial accounting information they asked for back in November. later I learned that the SIP Project accounting (Quick-Books) did not match up with the bank statements and the monthly reports which were submitted to BAASS each month. Carrion did all of the monthly reporting to BAASS on spread sheets. The BAASS auditors went through the Quick-Books and found that the monthly (spread sheet) reports did not match up. BAASS responded back to Harzan and asked for all of the MUFON bank statements from the SIP project and the MUFON checking accounts. Harzan ordered the operations director to send them to BAASS. Harzan never conducted any kind of internal accounting on the bank records and made no effort to rectify any of the information on the monthly statements with Carrion. Essentially the whole bag of dirty laundry was handed over which, was a very reckless mistake. Carrion was still International Director while all of this was going on, yet he was not told about any of this until it was all over. In all fairness, Carrion was never given a chance to rectify the accounting or put together any kind of final report to make sense of it. The Operations Manager soon found herself in the middle of a modern day inquisition. She had worked closely with Carrion and basically took direction directly from him as to what information to record and who to pay. I personally believe she is honest and did the best she could in managing the funds for the project. In her defense she did not have any kind of financial training or bookkeeping experience. She relied on Carrion for direction and with him suddenly out of the picture and many loose ends from the project laying around (unfinished business) she found herself being interrogated by the BAASS auditors. The Auditors were questioning her about discrepancies between the Monthly Statements sent to BAASS and bank statements. I have never understood what would have motivated Harzan to effectively throw Carrion (and the operations manager) to the wolves, other than to clear himself and the other Board members. Unfortunately this had a very destructive effect on MUFONs credibility. Note: It should be noted here that the SIP bank statements reflected a number of ATM Cash withdrawals from the SIP account. These kind of transactions would be normal in a personal checking account, but are not at all typical in a business banking account and would understandably arouse the attention of any auditors. It was the practice during the SIP Project to provide money to investigators to pay hotel and meal expenses. MUFON used Wal-Mart Visa cards, so when a deployment initialized, the operations manager would make a cash withdrawal from the SIP checking and then make a corresponding deposit into the respective Investigator's Visa Card at Wal-Mart, so they could pay the hotel bill. None of this was clearly explained in the whole bag of raw financial records that was turned over to BAASS. MUFON was presented in the absolute worst possible light. January was a busy month for the MUFON Board. BAASS sent a formal letter on Jan 19th 2010 to the Board essentially indicating BAASS auditors found about 35 financial indiscretions (discrepancies) in the reports MUFON provided to them accounting for how their money was spent. BAASS was very professional in their correspondence, but thanks to Harzan (and all of the dirty laundry he shared with them) they had MUFON in a very delicate situation. 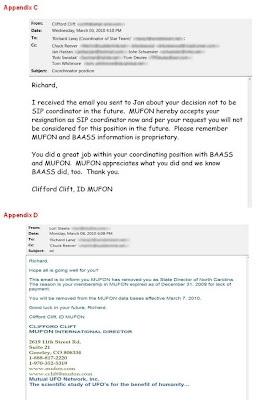 The MUFON Board now headed by the new international director (Clifford Cliff ) responded in a letter that was purposely not copied to Carrion and blamed him for why the MUFON-BAASS relationship was in jeopardy. Specific language in the Board's letter like “we are sorry that we gave James responsibility without proper oversight” and "the Board was “shocked” about (the discrepancies) were a last ditch effort in my opinion, for the Board to clear themselves and use Carrion as scapegoat to take the full blame. Someone leaked a copy of the Board's letter to James Carrion and he was understandably outraged. He responded (1-27-09) with a very sober Letter of Resignation to the MUFON Board, criticizing them for not consulting with him and giving him a chance to get the books in order before they handed everything over to BAASS. He stated "All of the issues they had with bookkeeping in their critique letter which the Board was “shocked” about were ridiculous and petty and to agree with BAASS that monies were mishandled without first consulting with me is inexcusable"
As far as the Board being "Shocked" about all of this, doesn't sit well for me. I remember serious conversations with at least 4 of them (on more than one occasion) about some of these financial problems as I learned about what was going on while this mess unfolded. I recommended that a professional CPA be used and a full accounting be done. The project ended prematurely in January 31 2010 when the remaining funding ran out. I was instructed by Harzan & Cliff to shut down the Dispatch Operation. Cliff stated that the official reason was to be "that the program was officially over due to an end in the contract". On 1-22-10 the MUFON Dispatch operation was Shut down at 9:00 PM EST. The Dispatch Operators were notified in a conference call (I facilitated on 1-23-10) that their employment had been terminated. I was instructed to remove the BAASS Investigator's passwords and user IDs from the CMS data base and they were deactivated accordingly. BAASS no longer had access to the CMS System. As the funding dwindled MUFON kept leading me on hoping for me to stay and help with damage control. Harzan (and other board members) told me repeatedly not to worry because that they had enough money to pay me through the end of Feb. 2010 and probably March. They had made a promise to me that at least 2 weeks' notice to be given to end my employment. The operations manager confided to me that there was another mistake and they did not have as much money in the bank as they had previously thought. Finally I got a call from Clifford Cliff on the last Friday in January (29th). He told me that this payroll check I was getting (that day) would be my last. He tried to blame it on BAASS indicating they had failed to send additional funding. The SIP Operations Manager was terminated one week later. 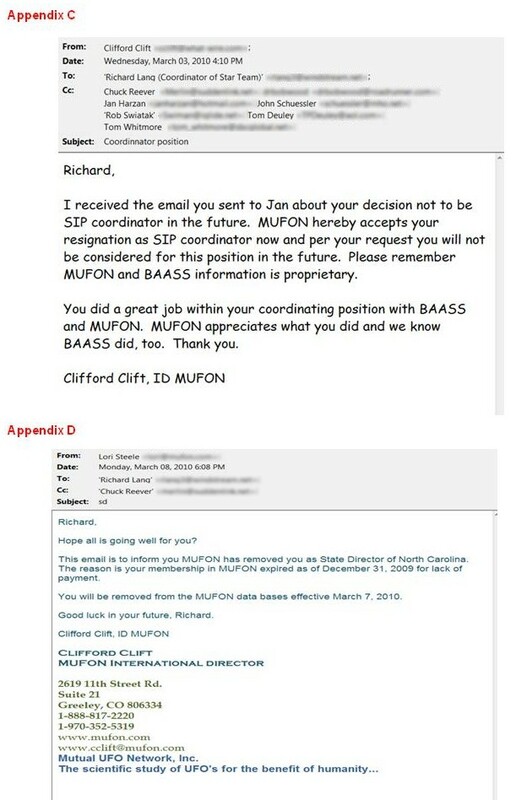 February 2010 I spoke with Clifford Cliff several times after the shut down in January. I was totally surprised when he asked me during a conversation about BAASS and wanted to know why BAASS had not given MUFON copies of all the BAASS investigation reports. I realized from our brief discussions that he was totally clueless about what was going on in MUFON and did not understand even the most basic parts of our agreement (SIP program). I remember how frustrating this was because I did not trust Harzan and had no confidence his leadership ability. I contacted BAASS and shared with them my concerns about MUFON as information continued to develop about MUFON accounting (and the way the Board handled everything). I was more and more uncomfortable being associated with that current MUFON Leadership. I advised BAASS in event that if funding for the SIP Project was ever re-negotiated (at some future point) I wanted to make sure they were aware of my decision not be employed by MUFON again and my services should not be offered in any negotiation by MUFON. I also advised the MUFON board of my decision. MUFON was broke and had to close the office in Fort Collins and lay off the last of the two Staff employees. "A Petition to the MUFON Board of Directors is Currently Circulating the MUFON Membership . . . . Demanding Changes Within the MUFON Board"